DWELL: make a changing table from an IKEA dresser. A nursery is not complete without an area to change a dirty diaper, right? Rumor has it… we will be changing LOADS of diapers pretty soon! I’ve shown you a bunch of DIY projects and several corners of our future little girls nursery. But, I haven’t shown you this wall of the room yet. It is taken up by this huge, white dresser that we are also using as a changing table. We did not buy an actual changing table. This specialty item seemed (to me) like a borderline useless piece of furniture. Yeah, you will use it to change diapers and store stuff, but after your kid is out of diapers… then what? I decided to create my own space for diaper changing that could continue to be used for storage as our child grows. Apparently, all you need to create your own changing table is a big dresser, a sturdy changing pad, a lamp and some diaper accoutrements! Based on the recommendations from a great baby products review book I read this pregnancy, we decided to go with a large IKEA HEMNES dresser for the nursery. Aside from the tedious task of putting the darn thing together, we are happy with our choice so far. You can read more about our baby’s room furniture decisions here. This dresser is HUGE! It has eight ample sized drawers for our baby’s clothes and other items. 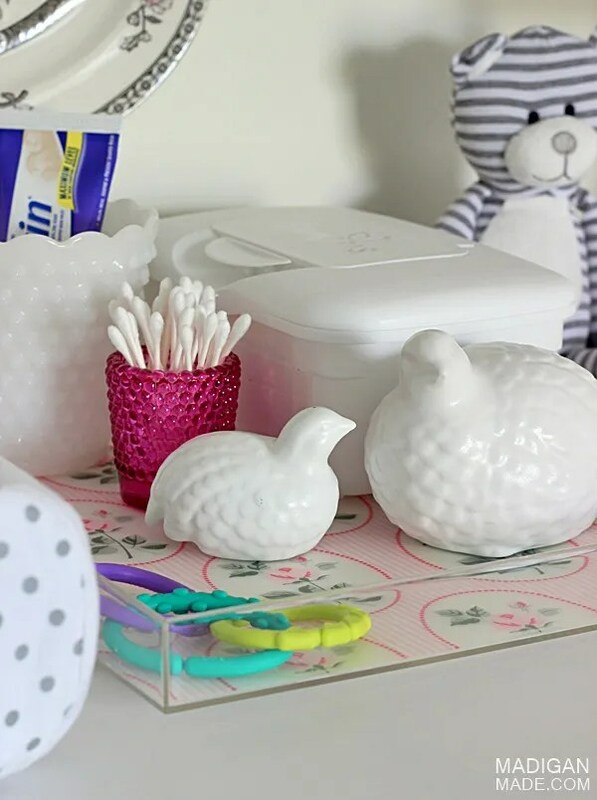 Aside from the tray on top of the dresser, we are storing the other needed diaper changing necessities (like diapers, of course) in the top drawers. 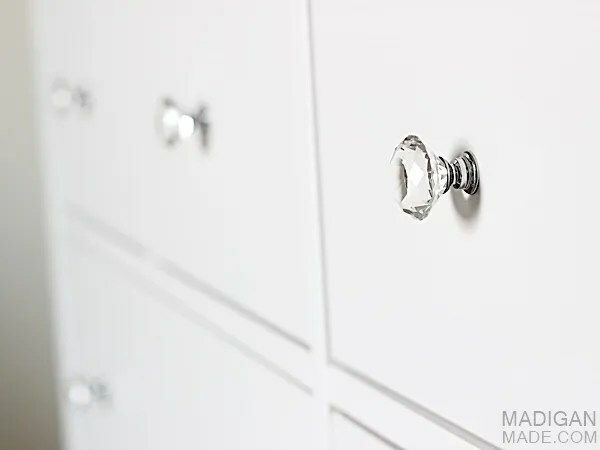 Changing out the standard knobs to these sparkly acrylic crystal ones was an easy and pretty way to customize the dresser for our little girl. A changing pad turns the flat top surface into a convenient diaper changing area. I added a tray with some wipes and two hobnail glass containers to hold any needed creams, etc. we wanted to keep handy. For a little touch of whimsy, I placed a painted momma and baby bird on the tray, too. The other areas of the room had a lot of things already up on the walls, so I wanted to keep the décor on this wall simple. I decided to hang a small collection of vintage plates at one end of the dresser (away from the reaching arms of a curious baby). The pink and gray flowers in the plates coordinate with the space and the vintage element ties into the other antique images I’ve used in the room. One of the plates (the deep pink ‘moss rose’ pattern) is part of the china set that I inherited from my maternal grandmother. It was important to me to have a ‘piece’ of my grandmother in our little angel’s room. Plus, the deep rose pink color of the flower on the plate partly inspired this room’s colors. I received the other plates from my husband’s mom and I picked a couple up from antique or thrift stores. 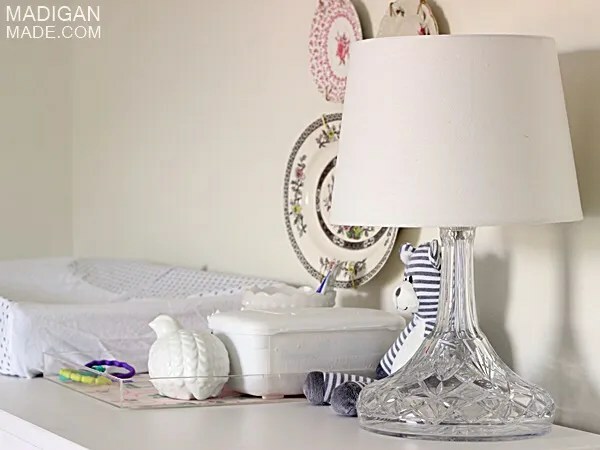 And, of course, the pretty DIY crystal lamp I made from a decanter sparkles at this end of the dresser, too. It is the perfect size for this corner. It twinkles all day long, with or without the light on! 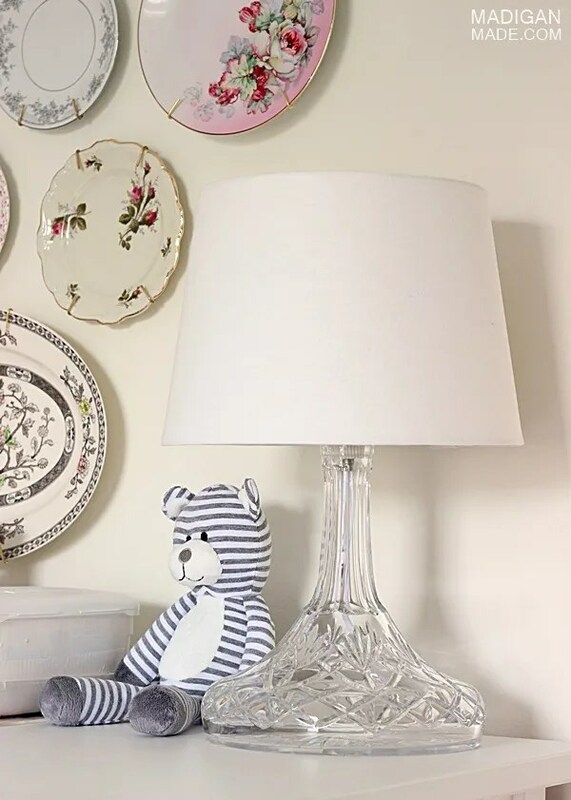 Now, I realize that there are a few breakable items at this end of the dresser, which I know may be a little risky for a child’s room. After talking with several seasoned moms (like my mom, mother-in-law and a few others), their advice was that we will probably be OK with this pretty (fragile) décor for about a year or so. Once the baby becomes a toddler and starts to explore (and maybe climb!) we may need to relocate some of these glass and ceramic pieces. 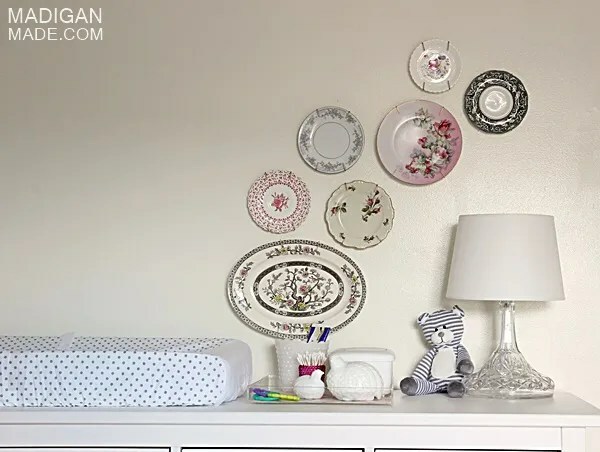 We will cross that bridge when we get to it and baby proof as our babe grows (and who knows, we may be ready to tweak the room’s décor a little anyways, too). Right now, we want to enjoy all the pretty elements in this corner. So, I think you’ve seen most of our baby’s room by now! We love how it turned out and I will recap everything and give you the grand tour soon!